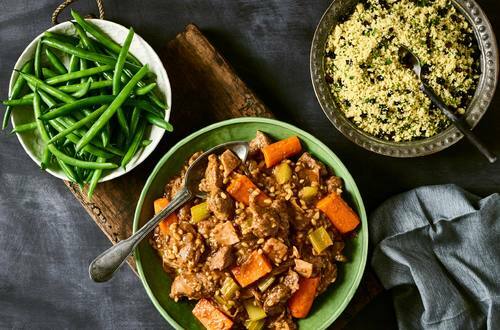 The beef will melt in your mouth with this slow cooked hearty stew. Put everything into the one pot and leave it to simmer away. This delicious dinner basically cooks itself! 1 Coat beef in flour and shake off excess. Heat 1 tablespoon of oil in a large fry pan and fry beef in batches until browned. Set aside. 2 Heat remaining oil and fry onion, garlic, carrots, celery and bacon. Add beef back to the pan and add tomato paste, water, orange juice and Stock Pot. Bring to the boil, cover and simmer for 1 hour. Soak barley in cold water. 3 Drain the barley and add to the pan, cook for a further 30-40 minutes or until meat is tender and barley is cooked. Serve with green beans.